Our garden is near the end of it’s season and our dogs are going to miss their fresh veggie snacks. They need a taste test of something we can buy them in the off season. Always looking for a healthy alternative for Riley. 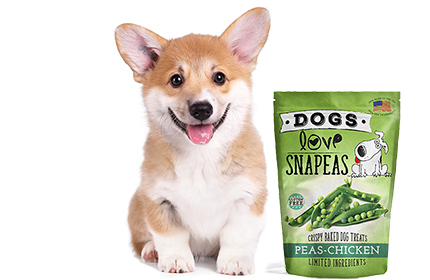 He loves green beans and carrots, so the peas would be a great addition to his veggie snacks!! My Leah, a rescued black lab mix, loves snap peas snacks. Now that she is a senior at 11 years old, she needs to watch her figure and calorie intake just like us humans! This is a perfect, satisfying treat I feel good to give her. She would be very grateful to receive this wonderful treat for free!! My dog loves treats and when he is happy, so am I! These healthy snacks would be a great to have! My dogs love treats ,but I think they would want to donate them to dogs that are going through the hurricane . Prayers for those pets and families. I and my dog need FREE Dogs Love Snapeas Crispy Baked Dog Treats from 1800PetMeds! because I love giving my dog new treats to try and he loves vegietables (and just about anything else)!!! Thanks PetMeds!!! My little liilr dachshund Goosey is so special. I adopted her from an agency that recuues dogs from puppy mills. She is 12 years old and would love all flavors especially the peas and cheese. She cant get enough cherse. She has seizutes and would love to give her a very special treat. So please consider her for the prize. I think she deserves it. Ruby would love to try these. She’s really good at trying new stuff and this looks really yummy! Crispy and crunchy is perfect for my Beagle Paulie! 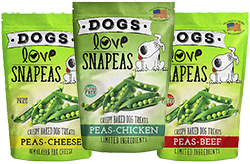 And the fact that Love Snapeas Crispy Baked Dog Treats are healthy for him makes me feel good! Thanks for the opportunity to win such a great product! I need to convince my lab mix, Cash, that eating good substantial food will make shredding all of my couch pillows even MORE exciting and fun! Our two dogs have been on a pantry assiatance program after I suffered a severe accident in wheelchair over 5 years. They rarely get treats and I used to spoil them with toys, activities and treats often. Please choose Sabri and Brutus! My best bud granddog, Beau, has skin allergies and sensitivities and I’d like for him to try these cool treats. My pit is a new mommy and she needs all the good stuff she can get to build herself back up! And she has six pups that are growing like weeds that I bet would try them too!! My chihuahua, Lily, has congestive heart failure and eats a low sodium diet. It’s unbelievably difficult to find treats with no added salt! She would love these and I’d feel good giving them to her! I am always looking for new, healthy treats to try for Miss Vixen! My Cider-Lynn like the real snow peas,so think she’d love these.She is a poodle breed,so kind of picky. My Dog Cinder-Lynn likes the real snow peas,so think she’d really live these a lot. She is a poodle and picky eater.